In 2017, Tower Plaza sold a total of 31 condos; 1 of which The Bouma Group was involved with. The amount of sales stayed consistent with 31 condos selling last year as well. Offers below the listing price were generally accepted, making the process of purchasing easier for the buyers. $350,000. 555 E. Williams St. #24J, Ann Arbor. 1027 square feet with 2 bedrooms and 2.0 baths. $245,000. 555 E. Williams St. #20J, Ann Arbor. 596 square feet with 1 bedroom and 1.0 baths. $240,000. 555 E. Williams St. #20i, Ann Arbor. 596 square feet with 1 bedroom and 1.0 baths. $203,500. 555 E. Williams St. #13c, Ann Arbor. 596 square feet with 1 bedroom and 1.0 baths. $200,000. 555 E. Williams St. #10D, Ann Arbor. 596 square feet with 1 bedroom and 1.0 baths. $197,000. 555 E. Williams St. #17i, Ann Arbor. 596 square feet with 1 bedroom and 1.0 baths. $197,000. 555 E. Williams St. #13l, Ann Arbor. 596 square feet with 1 bedroom and 1.0 baths. Currently, the average listing price of condos at Tower Plaza is $187,917, which is an increase of 7.5% compared to the average sale price last year in 2017. The average price per square for the 31 condos sold in 2017 is $358.00, which is a great increase of 14% in comparison to the A$/SF of $314.00 in 2016. For more details and information about Tower Plaza, contact the condo specialists with The Bouma Group at (734)761-3060 or email info@bouma.com. 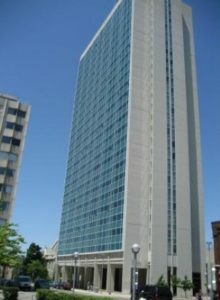 Learn more about Tower Plaza here!